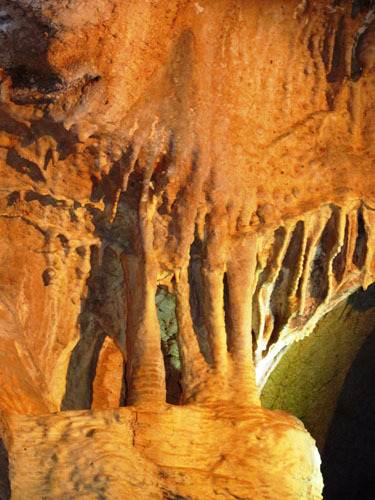 Unlike other Texas caves, Longhorn Caverns was created by rivers surging through cracks and holes in the earth millions of years ago. 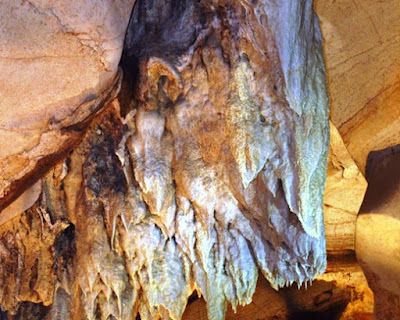 Water dissolved and cut on the limestone bedrock of the area, leaving behind unusual rock formations, domed ceilings, large sinkholes, sparkling crystals, alabaster dolomite (mistaken for marble or diamonds by early explorers), and rock carvings resembling animals and human faces. Our guide on a recent tour was a historian, so he shared some facts about Texas history and Hill Country geology, especially as it relates to Longhorn Caverns. Prehistoric peoples used the large room next to the main entrance for shelter and a place of refuge. Because a thick layer of mud and debris was left in the cave a million years ago, early visitors could only use a small part of the cavern. In the 1930s, the Civilian Conservation Corps (CCC), dug out much of this debris and opened up several rooms beyond the large room next to the main entrance. Following the CCC’s work and further development, Longhorn Cavern was opened to the public in 1937. Fossils dating to the Ice Age have been discovered in this prehistoric place, and evidence suggests Comanche Indians inhabited the cave at least 400 years ago. After Anglo settlers discovered the cavern in the mid-1800s, the Confederate army used bat guano found in the cave to secretly manufacture gunpowder during the Civil War. Popular legends claim outlaws used the cave for a hideout perhaps hiding stolen money there (which people later tried unsuccessfully to find). In the 1930s ladies and gents dressed up to enjoy an evening of dancing and drinking in the cavern. Our group of five took the walking tour which covers 1.25 miles round trip and lasts about 90 minutes. Tours are offered year-round multiple times a day, and you must sign up when you arrive as they do not take reservations. If you’re looking for more of a challenge, sign up for the Saturday Wild Cave Tour. With a guide, you’ll crawl through tight spaces for two hours using only a headlamp for light. If you like a good mystery, learn about unexplained happenings on the evening Paranormal Tour, or book up to three hours of photography time in the cavern. 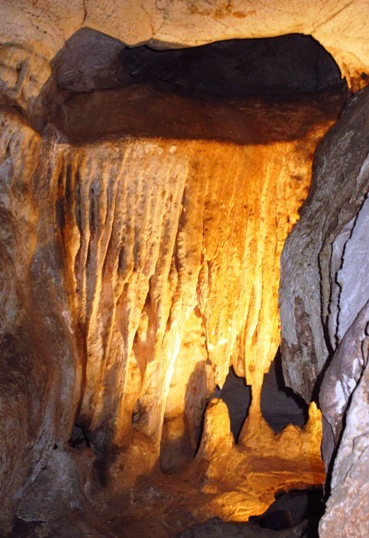 Located in LonghornCavern State Park on Park Road 4 near Burnet, the cave is less than 90 miles from Austin. Temperature inside holds at a pleasant 68 degrees. Hiking trails through scenic oak and juniper landscapes, shaded picnic tables, a snack bar and gift shop are additional attractions for visitors to enjoy.